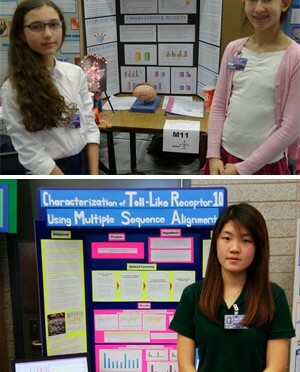 On Tuesday, April 1, 2014, students in the Halton Catholic District School Board participated in the 54th annual Bay Area Science & Engineering Fair (BASEF), held at Mohawk College in Hamilton, Ontario. Each year, the science fair is open to all students in grades 7 to 12, under the age of 21 who attend school in the city of Hamilton, Halton Region, Brant County, Haldimand County or Norfolk County. As part of this free science fair competition, students were given the opportunity to showcase their projects to the public, as well as participate in student activities, followed by a judging process. Over $140, 000 in cash, prizes and scholarships were awarded. During the month of May, 16 students with top projects will move forward to compete in the Canada Wide Science Fair, to be held in Windsor, Ontario. In addition, the top 3 secondary winners will travel to Los Angeles, California in May to compete at the Intel International Science and Engineering Fair. Best of luck to all of the students as they share their remarkable projects and participate in the upcoming national and international fairs!